In 2007, before all the economic "unpleasantness" began, Vault conducted a survey of BigLaw firms about which schools best prepare their students for practice. Our list of the most employable students offered a comprehensive view of which schools top firms recruit from. According to NLJ, schools in New York, Boston and Chicago are your best bet for a BigLaw associate position in these rough economic times. It's clear that law firms are hiring more deeply at top law schools located near their headquarters--cutting down on travel and other HR costs. 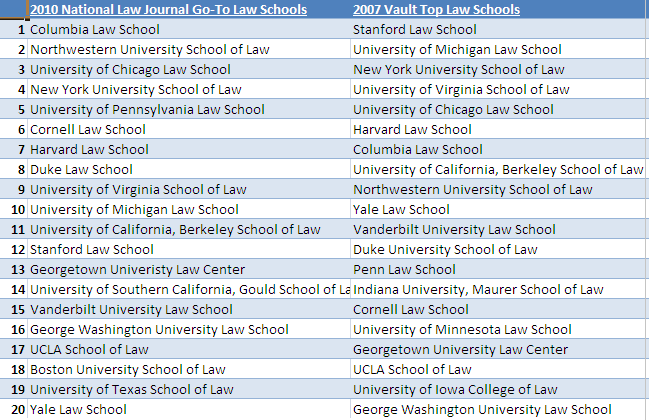 Students at Vault top law schools that didn't make the NLJ list still have strong employment opportunities, particularly at smaller firms and in the public sector. Moreover, as soon as the economy and law recruiting improves, top schools like University of Iowa School of Law and University of Minnesota Law School will be the first places firms go. To read more Vault coverage of the National Law Journal Law School Report, check out Brian and Vera's Law Blog.